I fear being hungry. I am not talking starving–just normal hunger that a normal person will feel when it is time for the next meal of the day. I didn’t used to be that way, but pregnancy and nursing did something to me. In August of 2004, I got pregnant for the first time. That pregnancy was a very, very rough one. I threw up (sorry) several times each day and each night. I woke in the night to go throw up. For 8 months (started a bit into the pregnancy). The last time I threw up was two hours before Brayden was born. I learned during that pregnancy that hunger=puking. Then the nursing began. If I didn’t eat constantly, I began shaking uncontrollably. The cycle repeated with a pregnancy followed by a year of nursing until the end of March 2010. It took me a few months after weaning McKenna to realize I feared hunger. Any sign of hunger sent me to the kitchen. I knew why, and I knew I was justified. But I also knew I had no reason to fear feeling a bit hungry anymore. I still have to fight myself on it and remind myself that being hungry an hour before dinner time is okay. Hunger in your children is also a fear of many parents. We worry and worry that the child is not getting enough to eat. We report to our husbands the number of bites our toddler took during the day while he was at work. We are concerned. Concerned enough that we modify menus and can find ourselves letting our kids eat throughout the day and eat things we wouldn’t prefer them eat. 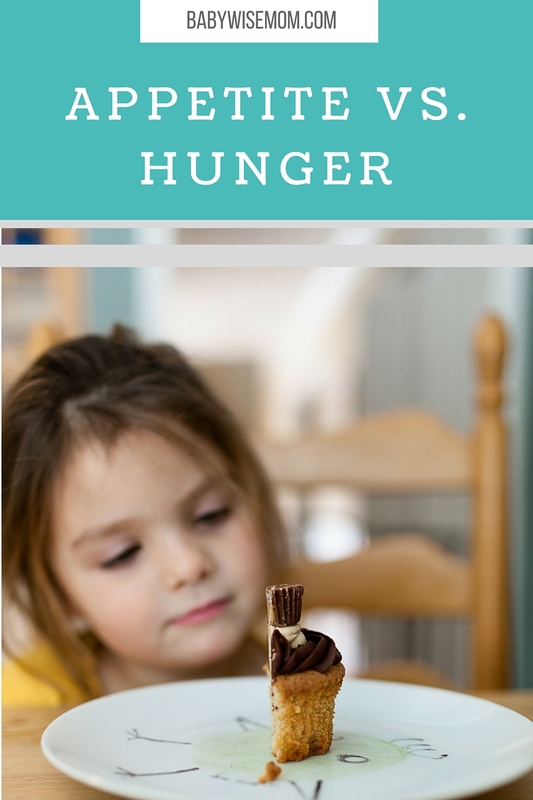 On Becoming Toddlerwise (affiliate link) talks about Appetite vs. Hunger (page 144). The authors define appetite basically as something you want and hunger as something you need. No matter the semantics, I like the point made in Toddlerwise. Sometimes, people want food just because it looks good, tastes good, smells good, etc. Not because we need it–just because we want it. That is different from satisfying our need for nourishment. I always say I have a separate dessert stomach; no matter how full I am, I can somehow always fit that dessert in there. In my experience, children are far better at eating to fulfill true hunger rather than simply desire than I am. They eat the amount they need to. No more, no less. But that doesn’t mean they always want to eat what is good for them or that they won’t want to eat a cupcake halfway between normal mealtimes if they see one. The problem with satisfying the desire for foods (like a cookie at 10 AM) is that you lead your child down the road to picky eating. Even if you give healthy foods constantly, you will create a situation where your child isn’t hungry at meal times and therefore won’t be hungry enough to be willing to try what the family is eating. Sometimes, kids get hungry before dinner is done. My kids get like that. With the older two, I tell them they can wait. 30 minutes is not a hard thing for a 5 or 3 year old. Although, I will say, Kaitlyn sometimes does not function well on low blood sugar, so sometimes she gets food if I see a need coming up. With McKenna, I first try to distract her with something fun to do to see if I can get her to wait until dinner is ready. If not, I give her fruits and veggies–food I know I am happy with her eating. Last night, for example, I gave her some frozen peas (she loves frozen peas). When my older kids randomly ask for food and it is not close to a meal, I ask them what they are interested in. It is usually some sort of cookie or sweet treat. I offer them something like a banana instead, and they usually decline that. They aren’t hungry–they are just desiring to eat. So it is not about making children be hungry and you don’t need to be stuck behind a rule of no eating unless it is a regularly scheduled mealtime. It is about making sure you don’t spoil your children’s appetites with snacks and making sure they are ready for a meal so they are willing to eat the meal. Next time we visit Toddlerwise, we will discuss picky eaters. This is just the post I needed today. I always worry that my daughter, who just turned two, is eating just to eat. She has almost never just taken a couple bites and then is done. (I get so excited when that does happen though.) I give her healthy meals and healthy snacks, so it makes me feel better that she's eating fruits and veggies and not junk. She loves her desserts – she will ask for a cookie or ice cream after almost every meal. She sure learned about those quickly! She sometimes gets very cranky and wants to eat while I am making dinner. I thought she was at the age where she could wait a little longer, but she's just a little older than McKenna, so I think I'll give her a little something while I'm making dinner if I think she can't wait. Thanks for the post – very helpful for me! HI there,I'm new to this blog and I have a question and need some help- my 19month old is down to one nap- her schedule is as follows:8am-wake up9am eat10am-playtime, go out do errands12-lunch1pm-1:30pm-napShe will nap only 45 minutes! 2:15pm-wake up5:30pm-dinner8pm-sleepThe problem is that she will only nap for 45 minutes and she goes down about 7:30pm-8pm. Its been hard on us, because I know she needs more sleep time/nap time- but her shedule does not allow for 2 naps (we try two naps and she won't go to bed until 10pm) Any tips on how to get her to sleep longer? We tried everything- puttin her to bed on a full tummy, quiet time right before nap time, extending her wake time, etc- NOTHING has worked and she's now a toddler and we are fearing that she has gotten stuck to a pattern we can't get out of. Any tips? I tried the 45 minute intruder tips but it doesn't seem to work for my daughter. Kim, it sounds like your daughter is very similar to McKenna in the eating department! Katwoman,I would try for an earlier nap right now. So maybe nap at 12 instead of 1/1:30.